A spectrum analyzer measures the magnitude of an input signal versus frequency within the full frequency range of the instrument. The primary use is to measure the power of the spectrum of known and unknown signals. The input signal that a spectrum analyzer measures is electrical; however, spectral compositions of other signals, such as acoustic pressure waves and optical light waves, can be considered through the use of an appropriate transducer. Optical spectrum analyzers also exist, which use direct optical techniques such as a monochromator to make measurements. Spektri analüsaatorid Siin on 2 toodet. Isotropic measurement of electric and magnetic ELF fields. Frequency selective FFT measuring system with high dynamic range for electric and magnetic fields from 1 Hz to 400 kHz. Sensors in all three spatial directions deliver isotropic results for selective and wideband measurements. 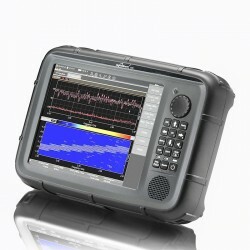 SignalShark® - Seven Senses for SignalsReal-Time Handheld Analyzer Just like that highly efficient hunter in the ocean, SignalShark derives its success in measurement from the interplay of its highly developed seven senses or sensors.